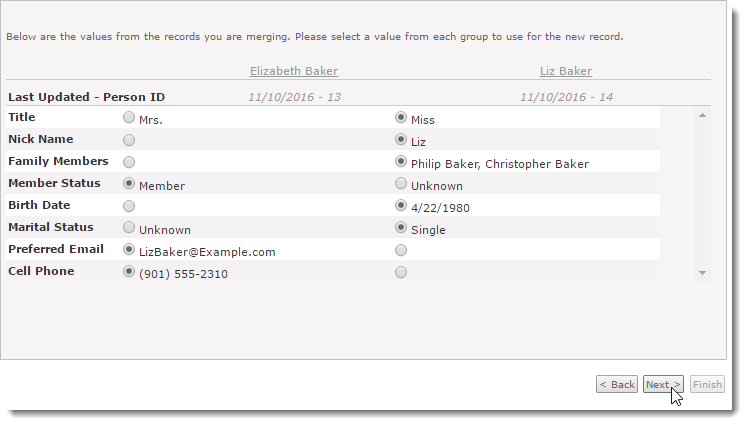 The Merge Members page allows you to merge two or more records including their associated data and relationships into one new record. Follow the steps below to merge records. 1. From the Membership menu, select the Merge Members option. 2. Click the Add Records link. 3. Enter search criteria such as the Last Name and then click the Go... button. 4. Check the names that you would like to combine and then click the Select button. 5. The records selected appear on the Merge Duplicate Members page. Click the Remove link if you have selected an incorrect record. Otherwise, click the Next button to continue. 6. A comparison listing appears and displays the values for each individual. Select the values to retain and then click the Next button. NOTE: The names to merge are listed as column headers. Click on a column header to view that record in another tab on your browser. When merging two records that both contain SubDonors, there is an option to select the default SubDonor. It is labeled as Gift On Behalf Of. 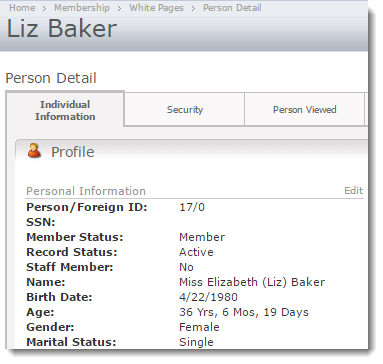 After the members are merged, both SubDonors are listed on the Person Detail page for the combined member. The one that was selected on the "Gift On Behalf Of" option is notated as the Default SubDonor. 7. The Confirmation message appears. Review the message. Click the Back button to review or make changes to your selections or click the Finish button to merge the records. 8. When the records have finished merging, the new "merged" record displays for your review.